Along with the message quoted above, the hackers left their official Facebook page embedded into the defacement, along with the names of each individual member that is part of their hacking group. The reasoning for the attack on the governmental agency is unknown as of yet. However, given the state of the message on the defacement page, it is safe to assume the hack was solely done to prove to the administrators that their website is unsafe and unsecured. The website as of the writing of this article is still defaced with the defacement file “index.html” still on the server. It is most likely that the administrators running the governmental website are not yet aware of the breach since the main page was not altered, nor does it seem like any data was stolen or leaked because a post about the attack on their official Facebook page does not seem to indicate any other malicious intent, other than just uploading the “index.html” defacement file. Screenshot of official post about the attack on the hackers collectives Facebook page. 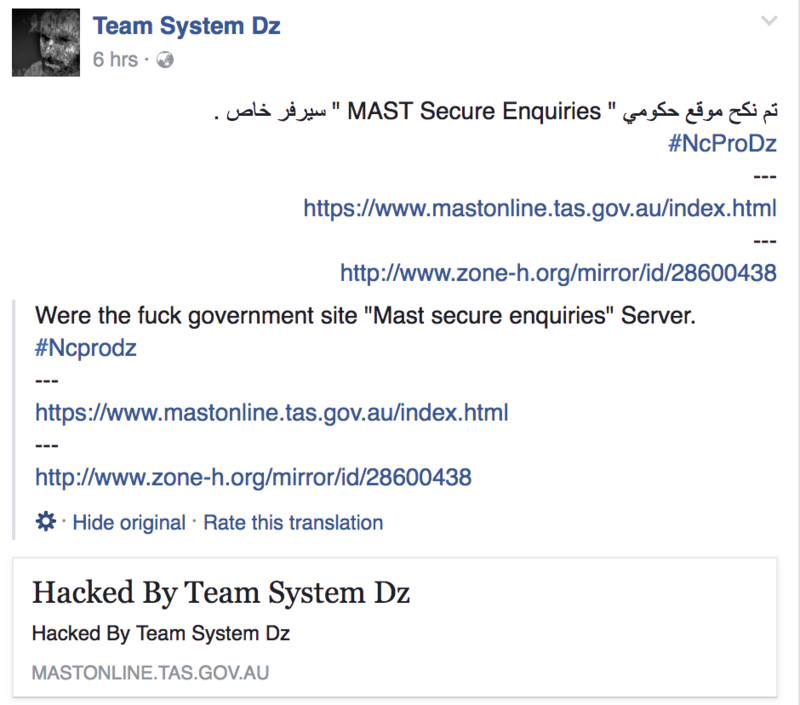 However, the hack itself should bring worry to the Tasmanian government website as to how the hackers may have exploited their website to deface it in the first place.